Western’s BT gage is a non-contact Bend and Twist Air Gage that measures engine connecting rod parallelism between Crank End bore (CE) and Pin End bore (PE) in the X and Y plane, and simultaneously measures the bore center-to-center distance. The modular test fixture is designed to accept many different size rods by simply changing the air gage spindles and lift plate. The pneumatic powered lift plate makes loading and unloading fast and easy. A cycle time of just seconds means this gage is ideal for high volume production environments. 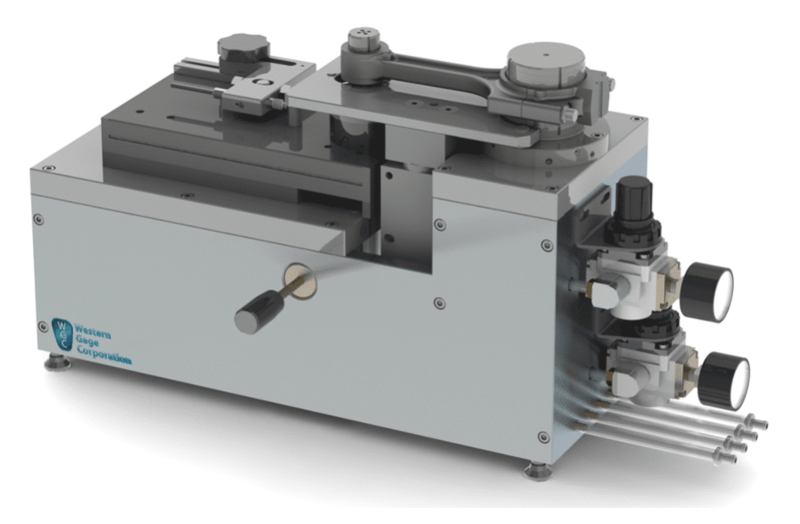 Integrated air bearings ensure accuracy by keeping the rod centered on the spindle. The BT gage works with our AEK air-to-electric converter and our Gage-Chek readout. See our online catalogue, page 33.